V-The ultimate Variety Show is a superb throwback event which features an assortment of amazing artists who specialize in a particular artistic expression. 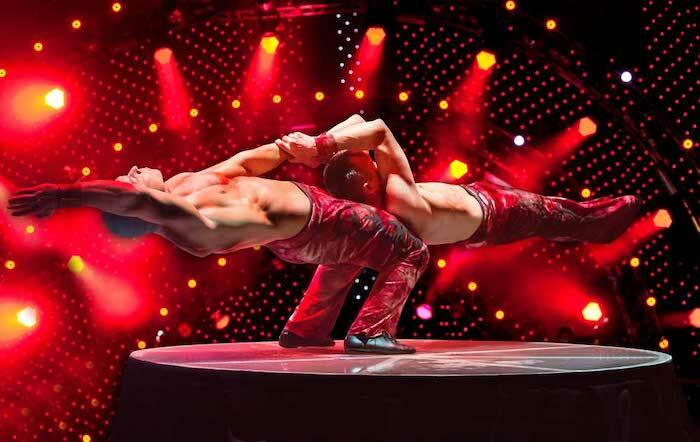 This 75-minute show has everything from jugglers to comedians to acrobats to skaters. Brought to you by the famed producer David Saxe, this family friendly show is a mixture of Vaudeville and the Circus which has been leaving audiences amazed for years. 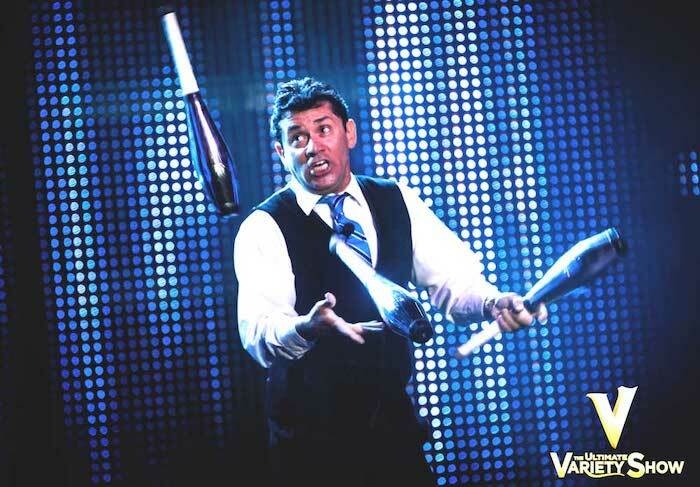 The world’s fastest juggler, Wally Eastwood, is the emcee for V-The Ultimate Variety Show. Eastwood has no problem keeping the audience entertained with his wit and intricate juggling between each unique performance. The layout of the show is really a collage of talented artists that have mastered a specific artistic skill. The nature of the show leads to a rotating cast that brings new light on an artistic expression which is displayed expertly by the talented performers. Throughout its run in Las Vegas, V-The Ultimate Variety Show has been fortunate to have several standout performers who grace the stage on a consistent basis. Such great acts include Melinda-The First Lady of Magic who mystifies the audience with her special illusions and sleight of hand tricks; the Skating Aratas have taken skating to an all new level with glitz and glamour; Russ Merlin-The Prop Comedian is hilarious in his creative use of stage props in his routine; the Quiddlers-The International Ambassadors of Physical Comedy perform their slap-stick style of comedy that is complete with funny costumes; Louri and Gabor-Hand Balancing is a duo of spectacular strength and agility when their bodies stretch to new lengths by a finger; Clint Carvalho and His Extreme Parrots prove to the crowd that his birds are smarter than humans; Tamara Yerofeeva-Rhythmic Gymnast flows across the stage with the grace of an acrobatic ballerina while she twirls ribbons and hoops in synchronized movements; The Crazy Gauchos bring their South American humor to a gut busting performance of stand-up comedy where anything goes and Turf-The Contortionist who can twist and turn his body into unbelievable positons. Each artist has entertained the crowds with their uncanny ability of artistic expression. The V Theater located within the Miracle Mile Shops at the Planet Hollywood Hotel and Casino is the ideal venue for V-The Ultimate Variety Show. This theater has plenty of good general admission seating as well as superb VIP choices. The multimedia effects during the show range from lighting to videos to fog to pyro techniques. The sound system helps the guest not miss a punchline or an introduction from the emcee Eastwood as he masterfully guides the show. 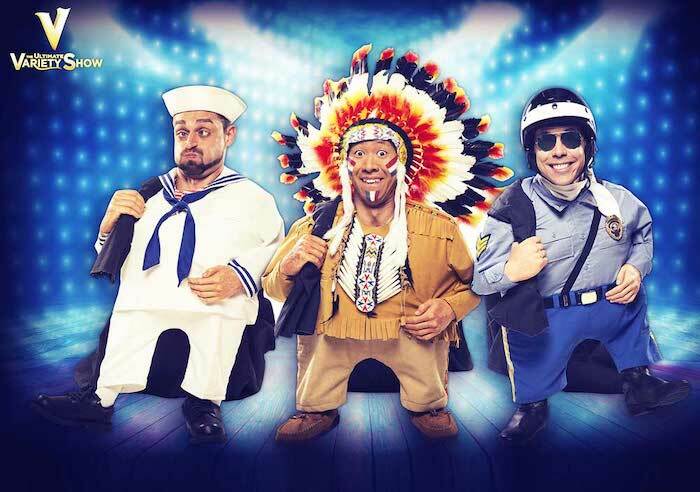 The mixture of vaudeville and circus type performances proves that V-The Ultimate Variety Show has something that will appeal to all members of the family. This event has been putting smiles on people’s faces for years with its creative spirit and talented artists. V-The Ultimate Variety Show is produced by well-known David Saxe who was born and raised in Las Vegas. Saxe has lived and breathed entertainment on the Strip while creating several award winning productions like Vegas! The Show, All Shook Up and The Mentalist. The cast of this outstanding variety show is star studded with an assortment of talented performers that include Clint Carvalho from Honolulu, Hawaii who has performed on the Strip for over a decade; Melinda Saxe got her break with a mystical performance in Branson, Missouri and has been featured on many episodes of Disney’s Magic Castle; Hailing from Long Island, New York, Russ Merlin has performed for the Queen England as well as with Bob Hope and Joan Rivers. Tamara Yerofeeva who is from Ukraine, placed sixth for her country at the 2000 Sydney Olympics in Rhythmic Gymnastics before starring on Las Vegas stages; Louri from Russia and Gabor resides from Hungary, together they have pleased audiences around the world since the 1990s; Wally Eastwood is a sixth generation performer from a family of trapeze artists, who has wowed Tommy Lasorda, Jay Leno and Jerry Lee Lewis; The Quiddlers have been performing since 1986 and hail from Oakland University in Southern Michigan; The Crazy Gauchos first appeared in Splash on the Strip and have been together since 1984; Turf, also known as Alonzo Jones, astonished audiences on America’s Got Talent and resides from San Francisco, California as well as the dynamic duo of Jenny and Victor Arata who have been thrilling audiences for years. The show is performing at the V Theater within the Miracle Mile Shops located at the Planet Hollywood Hotel and Casino. This 350 seat theater has good sight views for guests with the appropriate multimedia effects and superb sound system. V-The Ultimate Variety Show Las Vegas is open to all ages. The event runs seven nights a week with performances at 7:00 and 8:30 P.M. V-The Ultimate Variety Tickets are on sale now and they come in first come first serve seating to and up close and personal VIP view.